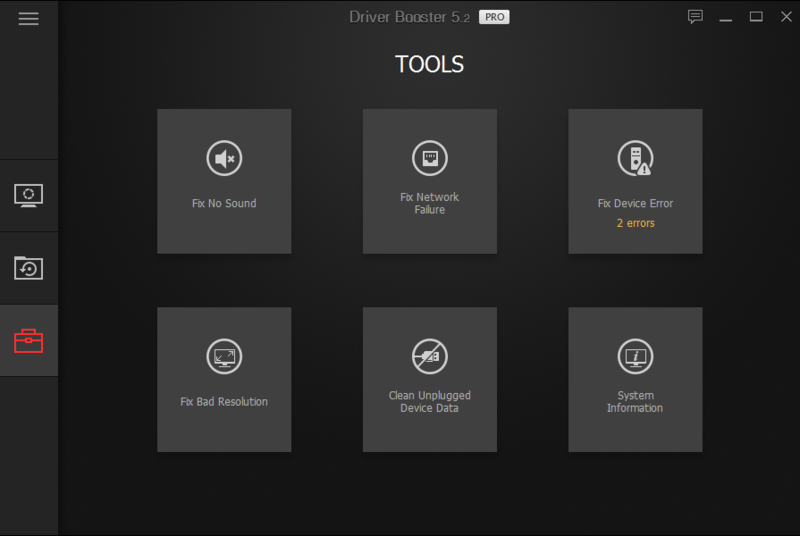 Driver Booster Pro 5.2.0 was available as a giveaway on January 20, 2018! 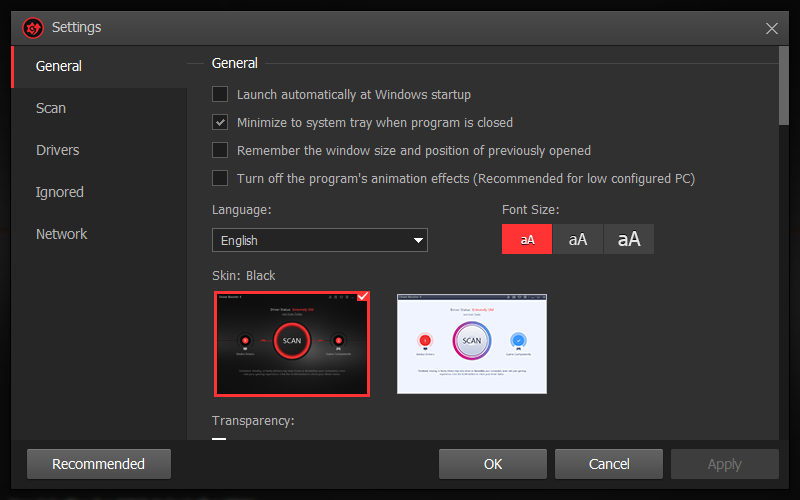 How would you improve Driver Booster Pro 5.2.0? I installed the free version a while ago and it worked great. Having the PRO version for free is a really nice bonus. Well done Giveaway of the day. well it found loads of drivers, installed them, then crashed the system big style lost every thing. So good Luck !!!!!!! Nothing Free is any Good, My Opinion. There's always a catch. Clean install as usual. First installs the Free Version. Activation code is in readme.txt file inside downloaded zip file. Copy the code then click on Activate and enter the code to get the Pro Version. Ignore the weird comments and go past them. It uninstalled my old version and then installed the new version. Clean install as usual. First installs the Free Version. Activation code is in readme.txt file inside downloaded zip file. Copy the code then click on Activate and enter the code to get the Pro Version. Ignore the weird comments and go past them. It uninstalled my old version and then installed the new version. Setup failed -- "no path". The free driver booster loaded but not the pro version, I couldn't find a way to get the pro to work. Mike G, i had the same problem. installed the free version, not the pro. Mike G, found the activation code. there should have been a 'readme' and a 'setup' file in your download. the activation code is in the 'readme' folder. copy that number to the bottom of your free account to activate the pro. With regards to my comment #9 and the response that I only buy "freebies" I had not mentioned that I actually purchased the full version of the main Iobit progran because I wanted to unlock more features, but I still got more nagging with regards to subsidiary programs. Then one day I ran Spybot and it brought up a long list of dodgy files... I deleted those, but the main program would no longer run. I said "enough is enough", so I had lost money, but at least no more nagware"
I have used it for years and on a Dell computer with so many missing drivers! I have used it for years and on a Dell computer with so many missing drivers! It's finds them all! I was going to buy it again, but today was a gift! Thank you giveawayoftheday team! Dorothy Medina, I have ben using this (paid version) for about a year, maybe more, and have never been "bogged down with advertiseents." These people are trying to earn a living just as you and I are, and if you have a complaint against them, at least make it legitimate before broadcasting as a pronouncement. I would never install anything from iObit any more because of the known problems with that company. However, not all driver detection software is completely useless. Speccy, for instance is portable, but gives enough information to be of use. Once you know the model and the maker of the most important components anybody can find the status of updates available from the manufacturer. Many reputable PC manufacturers provide for updates on their sites anyway. A wrongly chosen driver will normally be rejected when it comes to the installation. Drivers from obscure sources will install and wreck the machine. In these days of vulnerabilities known as meltdown and spectre everybody should be concerned enough to put pressure onto Intel and AMD and Microsoft to get whatever patches they can provide asap. I fear that I may well be EOL on 2 machines. I would never install anything from iObit any more because of the known problems with that company. That does not mean that one should not be aware of outdated drivers causing problems, particularly applicable to Win10. (XP and Vista are simply hazards when online and certainly do not need new drivers) However, not all driver detection software is completely useless. Speccy, for instance is portable, but gives enough information to be of use. Once you know the model and the maker of the most important components anybody can find the status of updates available from the manufacturer. Many reputable PC manufacturers provide for updates on their sites anyway. A wrongly chosen driver will normally be rejected when it comes to the installation. Drivers from obscure sources will install and wreck the machine. In these days of vulnerabilities known as meltdown and spectre everybody should be concerned enough to put pressure onto Intel and AMD and Microsoft to get whatever patches they can provide asap. I fear that I may well be EOL on 2 machines. I do not think most of you know how a driver operates and how it interacts with the other software installed. I will not try to teach anything here, but I will tell you how I know which driver is good or bad. I have two exact computers with same hardware and same software running one next to each other. One of them is never updated with new drivers and is used as a reference point for benchmarking. New drivers can work slightly faster or slightly slower then the benchmark, depending of who wrote the updates. If the driver updates come from the hardware vendors or the software department of the motherboards, they work the best because when drivers are updated they must work with the other drivers in tandem and share CPU interrupts, registries, memory and so on. If the timing is not correct, you may slow down other drivers or even make you computer crash do to overlap in timing. One driver can not take more CPU time than already allocated by the MB designer, therefore, updating constantly can create system crashes or even HD failures by installing drivers not specifically written for that hardware. After all, you can not create more time slices from the CPU for the new drivers than already allocated by hardware manufacturer. If the new driver is not timely sync with the operating system, you will start to have software crashes and blame Microsoft or other software vendors, without realizing that the new drivers have interfered with the OS or other application software. Be your own judge when updating drivers from unknown vendors, IObit does not write drivers, they may use unknown driver modifier's companies that do not comply with your hardware. I do not think most of you know how a driver operates and how it interacts with the other software installed. I will not try to teach anything here, but I will tell you how I know which driver is good or bad. I have two exact computers with same hardware and same software running one next to each other. One of them is never updated with new drivers and is used as a reference point for benchmarking. My experience is as following: New drivers can work slightly faster or slightly slower then the benchmark, depending of who wrote the updates. If the driver updates come from the hardware vendors or the software department of the motherboards, they work the best because when drivers are updated they must work with the other drivers in tandem and share CPU interrupts, registries, memory and so on. If the timing is not correct, you may slow down other drivers or even make you computer crash do to overlap in timing. One driver can not take more CPU time than already allocated by the MB designer, therefore, updating constantly can create system crashes or even HD failures by installing drivers not specifically written for that hardware. After all, you can not create more time slices from the CPU for the new drivers than already allocated by hardware manufacturer. If the new driver is not timely sync with the operating system, you will start to have software crashes and blame Microsoft or other software vendors, without realizing that the new drivers have interfered with the OS or other application software. Be your own judge when updating drivers from unknown vendors, IObit does not write drivers, they may use unknown driver modifier's companies that do not comply with your hardware. Sammy, Yes I agree with this. These soft wares are good to get drivers with a fresh install, I save mine onto another drive so next time no downloading, just show software where to store downloads, it will see other drivers and install. With all that said updating after system is running well can be bad thing. You should only download and install drivers from your MB site that supplies the drivers. They made your MB they know what works and what does. I have VIA drivers from my mb manufacturer and if I update to latest VIA drivers my Vdeck stops working, I am not able to switch to headphones , then back to speakers. And that is just one set of driver updates that this software downloads. Why? Because it see an update and that's all it knows, it doesn't know if it will affect my system or how it might, why I do not like these programs. In conclusion just download the drivers from your manufacturer website, store in safe place and check from time to time see if updates. 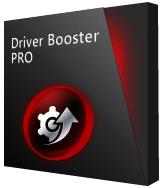 I will say this Driver Booster is best driver updater out there, if you know your drivers and which are good or which ones cause trouble, then ignore them in Driver Booster. If you don't know, then get them from MB site. Sammy, Yes I agree with this. These soft wares are good to get drivers with a fresh install, I save mine onto another drive so next time no downloading, just show software where to store downloads, it will see other drivers and install. With all that said updating after system is running well can be bad thing. You should only download and install drivers from your MB site that supplies the drivers. They made your MB they know what works and what does. I have VIA drivers from my mb manufacturer and if I update to latest VIA drivers my Vdeck stops working, I am not able to switch to headphones , then back to speakers. And that is just one set of driver updates that this software downloads. Why? Because it see an update and that's all it knows, it doesn't know if it will affect my system or how it might, why I do not like these programs. In conclusion just download the drivers from your manufacturer website, store in safe place and check from time to time see if updates. 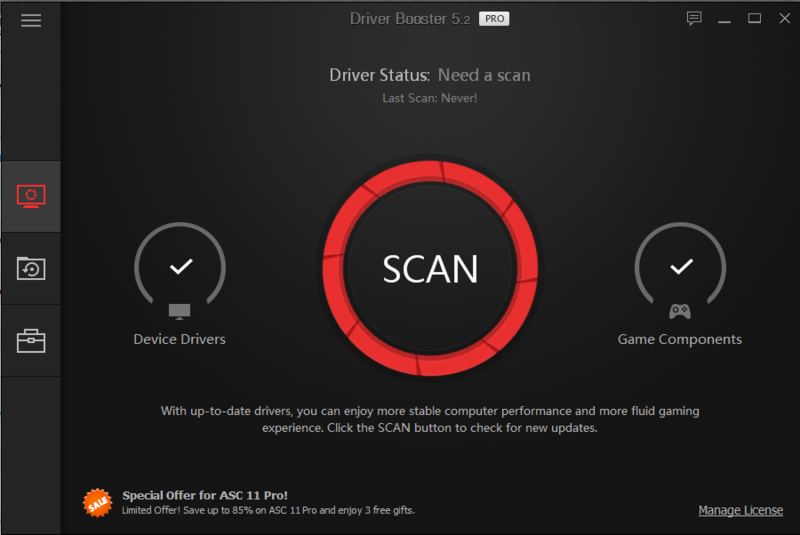 I will say this Driver Booster is best driver updater out there, if you know your drivers and which are good or which ones cause trouble, then ignore them in Driver Booster. If you don't know, then get them from MB site. plus you will get nagged forever from IObit with they're rentalware. Sammy, Well said...'if it ain't broke...' plus you will get nagged forever from IObit with they're rentalware. Nice. This is why I watch this site. The software is 99% useless to me (not necessarily bad, just useless to me), but the expert and well-written comments and/or good recommendations for other software is worth all the time I spend looking at this site. Sammy, Nice. This is why I watch this site. The software is 99% useless to me (not necessarily bad, just useless to me), but the expert and well-written comments and/or good recommendations for other software is worth all the time I spend looking at this site. Driver software is how the Operating System talks to the hardware, so it's always a good idea to backup first, just in case -- if something goes wrong, & Windows can't talk to the hardware components it needs to start, it won't. Second, it can be helpful to open Device Mgr. [it's in Control Panel], and note some of the details about the device [or devices] you're updating a driver for... like cars, these components or devices come in different makes & models, & it's all too possible to install a driver for the wrong brand, model, or even type of device -- Windows itself can even install mismatched drivers via Windows Update or when you're installing Windows fresh. While you can often roll back a driver in Device Mgr., it's best not to have to -- spotting a mismatch beforehand prevents that. Third, know the source of any driver you're going to install. Since some drivers load before Windows [and before any security software], they're an ideal target for malware. Driver software should come from the manufacturer or Microsoft -- iObit advertises their own database, which should be safer than downloading from driver sites, which are known for sometimes being dodgy. One of the lessons I've learned the hard way is to make a copy of the drivers used before upgrading versions or builds of Windows 10 -- I just copy C:\Windows\System32\DriverStore somewhere safe. Inside that folder you'll find the drivers for everything installed [along with a few that aren't]. They don't include the setup programs, but usually work if you have a problem by updating that component(s) through Device Mgr., telling the wizard to look for drivers in the copy of that folder you made. In stubborn cases you can find the folder with the driver you want, right click the .inf file & select install, or tell the update wizard in Device Mgr. to let you choose a driver, click have disk, then browse to that folder. None of it's pretty, but neither is a device that won't work after the win10 upgrade. Driver software is how the Operating System talks to the hardware, so it's always a good idea to backup first, just in case -- if something goes wrong, & Windows can't talk to the hardware components it needs to start, it won't. Second, it can be helpful to open Device Mgr. [it's in Control Panel], and note some of the details about the device [or devices] you're updating a driver for... like cars, these components or devices come in different makes & models, & it's all too possible to install a driver for the wrong brand, model, or even type of device -- Windows itself can even install mismatched drivers via Windows Update or when you're installing Windows fresh. While you can often roll back a driver in Device Mgr., it's best not to have to -- spotting a mismatch beforehand prevents that. Third, know the source of any driver you're going to install. Since some drivers load before Windows [and before any security software], they're an ideal target for malware. Driver software should come from the manufacturer or Microsoft -- iObit advertises their own database, which should be safer than downloading from driver sites, which are known for sometimes being dodgy. When it comes to driver software there are no ideal solutions, which is why software like Driver Booster Pro exists. Microsoft wants to host all drivers in the future, so fewer manufacturers let you download drivers that will install, e.g. Intel. At the same time, lots of manufacturers only give Microsoft a partial driver setup, e.g. AMD [ATI] graphics cards/GPUs, so you have to go to the manufacturer [e.g. AMD] for the full setup. And there are occasional driver hacks that can be worth the effort, e.g. : windowscentral[. ]com/how-enable-precision-touchpad-drivers IMHO where Driver Booster Pro [& similar software] can be worth it is with less common, but still often vital components, e.g. USB, I/O, audio, &/or network chips added to the main board by the manufacturer. Examples of other drivers that can be very hard to find are those for cameras, touchscreens, bluetooth etc. Microsoft is pushing out 2 new versions of Windows 10 per year, and the odds are greater that some things won't work after one of those updates unless newer drivers are installed. While today's GOTD is a 6 month license, the next 10 version upgrade is due around March, so you'd be covered. <i>[I have a tablet that, after a win10 version upgrade, was literally dead for 4 months until an Insider preview version came out with a working network driver. Prior to that win10 would die at the log-in screen, & if I used the prior version of 10, it would immediately start the version upgrade process all over again. ]</i> One of the lessons I've learned the hard way is to make a copy of the drivers used before upgrading versions or builds of Windows 10 -- I just copy C:\Windows\System32\DriverStore somewhere safe. Inside that folder you'll find the drivers for everything installed [along with a few that aren't]. They don't include the setup programs, but usually work if you have a problem by updating that component(s) through Device Mgr., telling the wizard to look for drivers in the copy of that folder you made. In stubborn cases you can find the folder with the driver you want, right click the .inf file & select install, or tell the update wizard in Device Mgr. to let you choose a driver, click have disk, then browse to that folder. None of it's pretty, but neither is a device that won't work after the win10 upgrade. I have had to remove all Iobit products from my computer, because I am fed up with the constant nagging, trying to make me pay for newer or pro versions... Pure nagware. It is a shame, because the programs themselves are excellent. I've paid for all of my Iobit programs and they still nag me to upgrade to a newer version which does not work with my licence serial number. I upgraded to a newer version once and then my uninstall program didn't work anymore. they tell you to upgrade to the newer version and neglect to tell you that you have to pay again for the licence that works with the new version. Used to be a time when you bought a program you'd get automatic updates for a year or 2 depending on your licence term without having to pay extra. Nick Ford, it occurs to me that one might be able to disable those features by renaming pertinent files, etc., just a thought. Destroyed my PC!!! On Windows 7 Professional - DON'T USE IT, Dell have told me that they'll fix it but I have to pay! I emailed Author but, not surprisingly, no answer!!! I should have created a System Image and Restore Point beforehand, lesson learnt! Installed on W10 then ran a system backup before proceeding any further. Program found 2 old and 3 extremely old drivers. Updated one at a time with a reboot after each update keeping fingers crossed. Happy to say everything is working. I've updated drivers in the past and I've ran into problems by trying to update all drivers at the same time. There are no guarantees as no two systems are exactly alike, so play safe, leave yourself a back door before proceeding. Even after the 6 months, it will break your nerves with advertisements! I presently have Driver Booster (not Pro) installed. This has on occasion updated drivers. After installing the Pro version it is finding many drivers with updates that should have been taken care of already by the non-Pro version. Or does the non-Pro ignore some as an incentive to purchase Pro? Just curious as to why this is. If this is the 'Pro' version, why is it that when I open the software I get 'Driver Booster 5.2 Free'? Disappointed. I downloaded the full 'Pro' version of Glary Utilities on Christmas Day and that's been brilliant so I'm not happy that this, masquerading as a 'Pro' version is actually the free edition which I already had installed! Did you attempt to register it using the activation/registration key/code within the Readme.txt file? It was in there along with the Setup.exe file in the downloaded package from this site. Ian Meen, Did you attempt to register it using the activation/registration key/code within the Readme.txt file? It was in there along with the Setup.exe file in the downloaded package from this site. Ironic...I updated the free version last night! Is this a one year licence or lifetime? konfucius, If you read above, it says this is a 6 month license. HellsBells, thank you, I missed it. As a matter of fact still don't see it but I'll take your word. This is awesome, I have used the free version on my computer. Will download for sure! Do I really need (it)this ??? 1. If you don't reinstall windows regularly. 2. You are running Windows 7 or lower. 3. You are running Windows 8 or 10 but having issues with windows updating them automatically. Alongside not knowing how to manually update them. Personally, I would find it useful as I reinstall windows every month. I have also found that some of the drives that pop up such as Sound Driver and USB Hub Driver tend to install drivers to your computer that flat out don't work. Then you need to rollback drivers. So all in all. If you have an issue with your pc or laptop and you don't know how to update or rollback manually alongside not reinstalling windows regularly then yes it might be worth it. Also if you are running windows 7 it will help a lot. But if you are on a clean install of windows 8-10 and not had any problems with the automatic driver updates and or know how to manually do it via device manager then there is no reason to get it. Totaly depends on the computer you are using and how you got it set up. The only reason to get this is: 1. If you don't reinstall windows regularly. 2. You are running Windows 7 or lower. 3. You are running Windows 8 or 10 but having issues with windows updating them automatically. Alongside not knowing how to manually update them. Personally, I would find it useful as I reinstall windows every month. I have also found that some of the drives that pop up such as Sound Driver and USB Hub Driver tend to install drivers to your computer that flat out don't work. Then you need to rollback drivers. So all in all. If you have an issue with your pc or laptop and you don't know how to update or rollback manually alongside not reinstalling windows regularly then yes it might be worth it. Also if you are running windows 7 it will help a lot. But if you are on a clean install of windows 8-10 and not had any problems with the automatic driver updates and or know how to manually do it via device manager then there is no reason to get it. Both programs are more accurate than Driver Booster Pro and they are FREE. 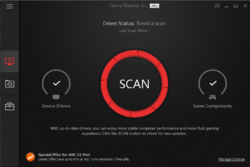 To update and manage my PC drivers I use DriverMax + Snappy Driver Installer (Portable app) Both programs are more accurate than Driver Booster Pro and they are FREE.